The sports department often has been described as the newspaper’s toy department. And Jim (Shaky) Hunt has no problem being described as one big kid. The Sarnia native, who turns 75 in November of 2001, has spent a lifetime writing and commentating on the wonderful world of fun and games. He would have it no other way. He spent nearly 50 years in the sports world, covering Stanley Cups, the Masters, U.S. Opens, Canadian Opens, British Opens, Super Bowls, Olympic Games, the 1972 Canada-Russia series and enjoyed the impressive run of attending every Grey Cup game between 1949 and 1999. Nicknamed Shaky because it aptly described his goaltending in the hockey intramural league at the University of Western Ontario, Hunt was in the first journalism graduating class at Western. Upon graduating in 1948, Hunt immediately was hired as a news reporter by the Toronto Star. Following a stint in the Star’s Queen’s Park Bureau, Hunt found his way to the Star sports department in 1952. He then moved to write sports for the Star Weekly Magazine in 1961 and in 1967 to CKEY as the AM radio station’s sports director and eventually its news director. 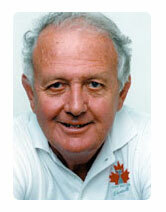 It was not until the fall of 1983 when Hunt fell into his dream job, a sports columnist at the Toronto Sun. “I have been lucky,” said Hunt, who after strolling into semi-retirement at the Sun in Nov. 1991 began a nine-year stint at the all-sports Toronto radio station Fan 590. “I guess you could say I have had trouble keeping jobs. But I have only applied for one job and that was the first one I had at the Star. I blundered into the other jobs. There is only one Jim Coleman. The same can be said about Jim Hunt.